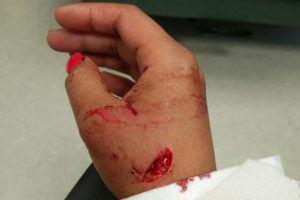 A woman violently attacked by a large PIT BULL in Garrison Crossing on Thursday is outraged the dog has not been seized. And the owner of the dog is apparently well-known to police. “I’m seething,” the woman told The Progress Friday afternoon. 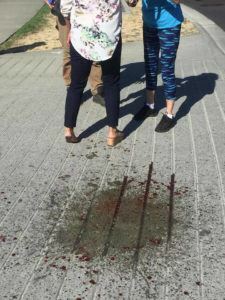 The woman, who suffered a large laceration and tendon damage, asked to be referred to as A.C. because witnesses told her who the dog’s owner is a man with a long record in the court system. He fled the scene after the attack. The incident happened Aug. 31 around 4 p.m. on Tamihi Way by the parking lot for Save-On Foods. The woman said she was walking her poodle cross, Rux, along the route as she often does, when the dog, described as an extra-large pit bull, got away from its owner. She said a man came to help and started hitting the dog with a piece of rebar and it would not let go. 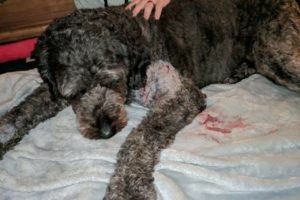 Another man got out of a truck and started spraying the dog with bear spray and still it wouldn’t stop attacking. At this point, A.C. said the owner was trying to get the dog to stop as well but he could not control it. Finally an individual with bear spray got the dog in the eye forcing the animal to let go for a moment, at least enough to end the attack although the aggressive dog was still trying to attack others. When asked if the man had been contacted by police, an police spokesperson said only that the Chilliwack RCMP were working with animal control on the investigation. A.C. said she is angry because animal control knows this dog, it already has restrictions, yet 24 hours later it hasn’t been picked up or destroyed yet. “That dog should have been wearing a muzzle,” she said. 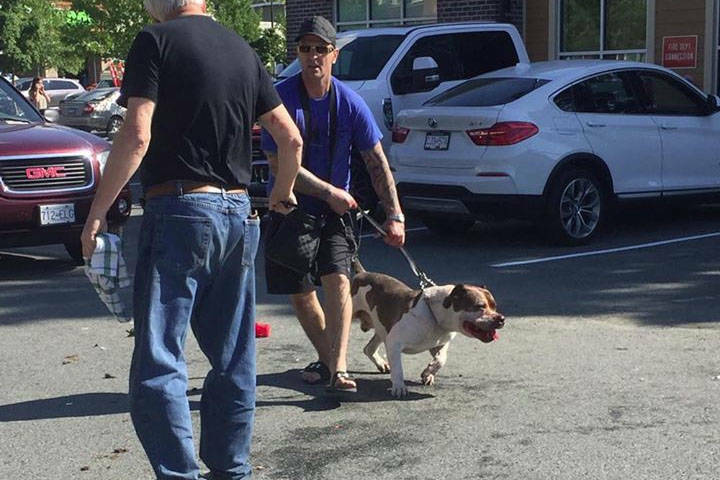 When asked if the dog had been destroyed or seized a Fraser Valley Regional District (FVRD) — which provides animal control services in Chilliwack — spokesperson confirmed they were working with the RCMP on the investigation. A number of witnesses at the scene told A.C. the dog’s owner’s name is Kristopher Benson. Benson was most recently arrested in November facing numerous property crime charges. “Cellphones, wallets, laptop computers, vehicle insurance papers, licence plates, and ammunition were seized by officers during the execution of the search warrant,” said Cpl. Adam Tallboy from Chilliwack RCMP CRU in a press release in November 2016. In April of this year he was found guilty and sentenced to five months jail. On his Facebook page, Benson has multiple photos that match the dog in witness photos from the attack. Not having BSL allows people like Kristopher Benson to own dangerous and vicious animals. Irresponsible man is also an irresponsible pit owner. Go figure. Is an anti-social animal something that attracts anti-social owners? Hmm.